It is very difficult to equip the rooms of your house without real furniture in Minecraft BE. Some builders use creativity and create pieces of furniture from blocks and things. For example, many players use steps and signs to build some semblance of chairs but somehow it looks a little ridiculous. DarkGlade03's Furniture addon adds 7 new pieces of furniture, textures and models of which are made in Minecraft style. New kitchen oven with the ability to cook meat. Added new chairs with the possibility of sitting. Support for Minecraft PE 1.2.16+. Added opportunities to use new furniture for its intended purpose. Put the garbage in the trash can if you want to get rid of unnecessary trash. Put things in the cabinet like a chest. Chairs can accommodate one player. There is nothing complicated, the addon uses shulker eggs as the main objects. Dyes are designed to turn this eggs into one of the pieces of furniture. 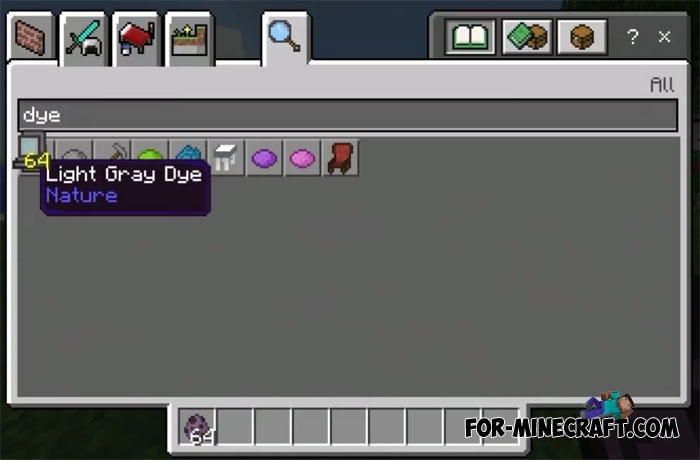 Take any dye and tap on the placed shulker egg. A moment later, you will see a computer, a desk lamp or any other thing. You can destroy improvised chairs and tables and put realistic ones. So far, none of the new items can not be used for their intended purpose, but future versions of the addon will allow you to do more and see new furniture. Do not miss the Master's Furniture mod and add a lot of new furniture to MCPE 1.2. How to install the DarkGlade03's Furniture addon?